Despite the low demand and the low popularity of e-books, and despite the widespread copyright infringement, the big guys in the hi-tech sector such as VTC, FPT and Viettel all are planning to digitalise textbooks. E-publication has become a popular industry in the world, which distributes books, journals and newspapers to readers via different equipments such as computers, tablets and smart phones. In Washington, for example, children learn on iPads, while in Uruguay, students do not carry books to school, but carry laptops or smart phones which they use to connect with teachers and classmates. In 2011, the Republic of Korea released the plan to spend USD2.3 billion to digitalize all the textbooks used for state owned schools prior to 2015. The moves taken by the foreign countries might make Vietnamese hi-tech firms think that such a process would occur in Vietnam, sooner or later. The big firms like VTC, FPT and Viettel, or smaller ones like Alezaa, AIC all have geared up with their plan to digitalize textbooks used in general schools and universities. In late 2010, the Ministry of Education and Training and Viettel, a military telco, signed a contract on implementing the investments in equipments, digitalizing textbooks and providing materials for training. In June 2012, the Vietnam Education Publishing House signed contracts with AIC and VTC Online on a cooperation program to publish e-books for nursery schools, primary, secondary and high schools. According to AIC, from September 2012 to August 2013, the firm would build up the software pieces that serve the teaching of natural science subjects at general schools. It is expected that the digitalization of the textbooks for other subjects would be completed by 2015. Bui Trung Ngoc, Marketing Deputy Director of Go.vn network, said besides the gradual digitalization of textbooks for general schools, VTC would also digitalise reference books, journals and university manuals for universities. In early 2012, the then CEO of FPT Truong Dinh Anh said the company was following some programs on digitalizing textbooks. Anh said that FPT was negotiating the cooperation with publication companies or the companies which hold the copyright for textbooks. “Our ambition is that Vietnamese students would not have to carry heavy books when going to school. 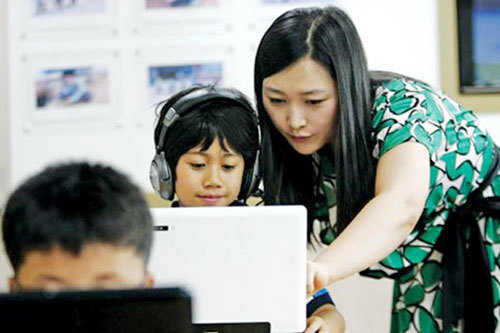 Instead of the books, they just need tablets,” Anh said. In late 2011, Vinapo launched the alpha version of the e-book distribution system Alezaa.com, the first one of this kind in Vietnam. Though Alezaa used Alezaa software for encoding to prevent plagiarism, the books published by the system were still pirated easily. Especially, one could learn about the method to download ebooks from Alezza by searching on Google. Enterprises all have agreed ensuring the security for e-publications should be the top priority task when joining the market. A senior executive of FPT also said that Vietnamese firms still keep puzzled with the security problem, stressing that this is the main reason which explains why firms still have not taken any moves to implement the plan on e-publication. The problem here is the awareness of the copyright. In developed countries, where customers always believe that they have to pay for all products and services, thus facilitating the development of e-publication. Meanwhile, Vietnamese people have the habit of using products and services free of charge. Experts believe that the only way to approach e-publication for now is that publishers join forces with technology firms to run the programs on data security.